Two people from KhmerOS project, Jens and Sokhem, will join aKademy this year at Dublin, Ireland. 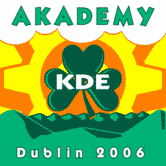 aKademy is the annual meeting of the KDE community. This event will spend nine days starting from September 23rd to 30th and includes an exciting program of talks and presentations by outstanding KDE developers, joint development, bug-fixing & coding sessions, workshops for all KDE contributors, and design, usability and polishing work. Jens will give a presentation on "KDE Cross Cultural - Experiences From The KDE Localization Process In Cambodia". Complex script, input methods, keyboard shortcuts, native digits, Buddhist calender and other observations related to Khmer language will be in his talk. His talk will be also included the communication barrier between western and Asian (e.g. Cambodian) contributors. You can find more information about his presentation at http://conference2006.kde.org/conference/talks/5.php. By joining this conference, we hope to learn from other country and share what we are doing regarding Free and Open Source Software (FOSS) in Cambodia.